YETI Coolers are built to take the rugged abuse that comes with the way we work and play. 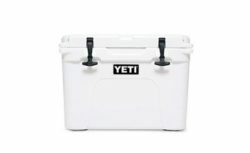 Unlike ordinary coolers, which are essentially “disposable”, a YETI is made to last! In the end, the functional purpose of a cooler is to keep the contents cold. By combining thicker walls, added insulation (especially in the lid), and a full-frame gasket, YETI Coolers out-insulate the others! YETI was founded in 2006 with a simple mission: build the cooler we’d use every day if it existed. One that was built for the serious outdoor enthusiast rather than for the mass-discount retailers. One that could take the abuse we knew we’d put it through out in the field and on the water. One that simply wouldn’t break. We decided early on that product innovation would come from necessity and firsthand experience – not from market research and data analysis. Today, YETI products perform when it matters most – whether that be an excursion into the remote Alaskan wilderness, chasing redfish on the Gulf coast, or just getting together with friends in the backyard. 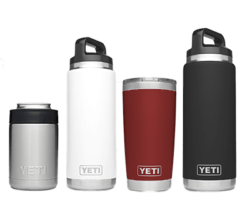 Outstanding thermal properties set YETI apart. It works as an ice supplement, a welcome addition to your ice stash to make sure your contents stay colder for longer. Transform your LoadOut 5 gallon bucket into the ultimate multi-tool with our full Lid, Caddy, and Gear Belt setup. Keep everything you need organized and available with accessories that are as durable as the bucket they’re designed for. A major benefit of the YETI Tundra, Roadie, or Tank cooler is its dry ice compatibility. There are a few hints and tricks to using dry ice safely and effectively. When used in your YETI cooler, dry ice can keep food and drinks cold and frozen longer than regular ice. Dry Ice is the frozen form of carbon dioxide and its -109° F temperature makes it perfect for freezing quickly and keeping items frozen. Dry ice gives off more than twice the cooling power per pound than regular ice, and this added benefit provides a dramatic weight savings when packing your YETI Tundra, Roadie, or Tank. YETI does not recommend using dry ice with the Hopper series of coolers. Dry ice is completely safe to be used alone or combined with regular ice, but there are handling precautions to keep in mind. Because dry ice is so cold, it must be handled with protective leather or cloth gloves (oven mitts or hand towels also work) to prevent freezer burning. It is also wise to keep dry ice away from small children. One other safety item to keep in mind is ventilation. Because dry ice is frozen carbon dioxide, when it melts, or sublimates, it gives off carbon dioxide gas. It is not harmful, but without proper ventilation (example: riding in a closed vehicle), it can cause shortness of breath, and in extreme cases, loss of consciousness because the carbon dioxide will displace oxygen. The simple solutions are as follows: store your cooler with dry ice in well-ventilated areas and make sure there is proper ventilation during transportation. We take pride in the products we make and warrant to the person who originally purchased the product (“you”) that all YETI products will be free from defects in workmanship and materials for their applicable Warranty Period, subject to the below conditions. You must have used the product only as intended and in accordance with the product’s care instructions. If a defect occurs as the result of the Product’s intended use according to the care instructions during the Warranty Period, we will repair or replace, at our discretion, the defective product or part. The warranty does not cover defects caused by third-party modifications, repairs, or replacement parts. Punctures, scratches, normal wear and tear, and the natural breakdown of colors and materials over extended time and use are not warranted.